Richard Boswell’s NASCAR Nationwide Series debut will coincide with Tony Eury Jr. sliding into the crew chief role for the Chevy owned by Rick Hendrick but housed and maintained at JR Motorsports. 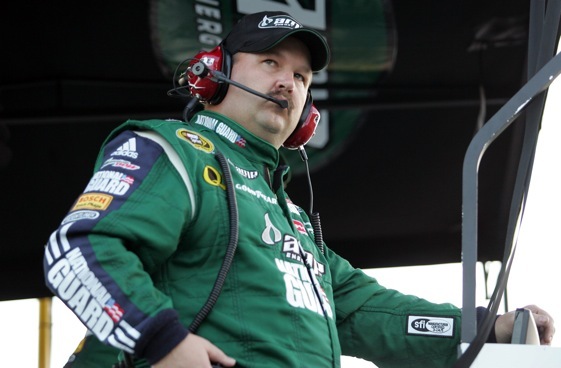 Eury replaces Brian Campe, who stepped down from the crew chief post earlier this week. The 25-year-old Boswell, who has spent the majority of this season competing in a Late Model, plans to lean heavily on the wisdom of the veteran Eury. “It’s going to take a little bit of pressure off, but at the same time it’s going to add a little bit,” said Boswell, a Maryland native who now resides in Mooresville, N.C.. “Just being able to work with (Eury) is an honor. Because the No. 5 has run a limited schedule this season, Boswell will be forced to qualify on speed Saturday morning. He’ll be among a group of 21 go-or-go home drivers gunning for 13 starting spots in the year’s final standalone Nationwide Series event. His weekend expectations are relatively conservative. “I don’t think anybody is going to come in against these regular guys and outrun them,” said Boswell, who turned about 50 laps in the Nationwide car during a practice session in Florence, S.C. on Monday. “They’re the best in the nation at short track racing. “The biggest goal is qualify in, obviously, for the race. We don’t have a provisional so we have to qualify in. And just keep our nose clean the whole race. Over the past four years, Boswell has developed a strong friendship with Dale Earnhardt Jr., who owns JR Motorsports. That relationship factored into Earnhardt putting Boswell into the car this weekend. “I’ve ran a Late Model at JR Motorsports for the past few years,” said Boswell, who is still uncertain of his plans for 2010. “Running a Nationwide race is always been something that’s been talked about. “It was kind of something that we thought maybe we’d do next year.